Can a Company Fire You Without Notice? When someone is unexpectedly fired without reason or without any notice, they often wonder if their employer had the legal right to do so. Unfortunately, the answer is yes in most cases. Since most workers are employed at will, the reality is that they can be fired without notice. At-will employment is a term used to describe the relationship between an employee and an employer in which either party may terminate the employment contract for any reason and without warning, so long as the reason is not discriminatory in nature. It is also illegal for employers to fire workers for discriminatory reasons based on age, race, religion, national origin, sexual orientation, gender, pregnancy, or disability. In addition, employers are prohibited from discharging employees as retaliation for whistleblowing or reporting illegal or unethical employer activity. Most employers are interested in maintaining high staff morale – by and large, that means not maintaining a practice of firing employees without notice. As a result, many employers have policies in place that govern conditions under which staff may be fired. Typically, managers will be required to meet with staff and issue warnings when performance is not up to standards. Often, managers will create a performance improvement plan to address any problems. In this case, employees are typically given a period of time to improve their performance. The manager will review the employee’s process and performance and will reconsider the outcome based on any improvements (or lack thereof) made. There may be an opportunity to appeal the decision to terminate your employment if you feel it wasn't valid. Information on the policy at your company may be available in the employee handbook, in your employment contract, or you may get the information from the Human Resources department. However, it’s worth noting that performance improvement plans are not always the last-chance opportunity they seem to be. At some employers, being placed on a PIP is the first step toward the exit. Should you find yourself in this situation, it’s wise to start looking for a job immediately, as well as doing your best to address the areas of concern mentioned in your review. In short, even if your employer has a termination process or has outlined a performance improvement plan, you shouldn’t assume that your job is safe for any period of time. 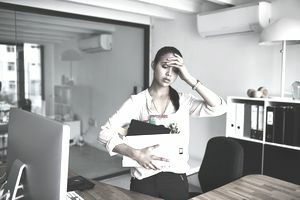 Although a firing may come without warning, many employers will still provide discharged employees with compensation for a period of time or severance pay, even though you may have been asked to leave the premises immediately. A severance package is a benefit or payment issued to an employee when he or she leaves his or her job at a company. Severance pay may include additional payments based on the number of months an employee worked, payment for unused paid time off, vacation, or sick time, compensatory time, a settlement instead of the usual notice period, continued medical, dental, and life insurance, retirement benefits, stock options, relocation services, and more. Severance pay is usually at the discretion of the employer and is only legally required under certain circumstances. For example, some states require employers to give severance packages to employees when they are doing mass layoffs, like a plant closing or filing for bankruptcy. In other cases, severance pay may be a part of the employment contract, and as such, all employees would be entitled to it unless there was some sort of gross misconduct or other disqualifying action. However, for at-will employees, a company is not obligated to provide severance pay or any other compensation when you have been terminated from employment. As long as the termination was made for reasons other than discriminatory ones, there is no obligation or legal requirement for any post-employment compensation. If you were not employed at-will and believe you were wrongfully terminated, or believe you were fired for a discriminatory reason, there are actions you can take. The first step is to make sure you know your rights. You can talk to the Human Resources department if you have questions about your termination. If you feel you have been unlawfully terminated and you want to take action, you can get information from the U.S. Department of Labor on how and where to file a claim. Check out your state labor department as well, because it might also have further information. You can also look up local bar associations for a number you can call to find an employment lawyer. However, keep in mind that although many employment attorneys will offer a free consultation, pursuing the case will cost money.